one of the pouches of the colon, produced by adaptation of its length to the taenia coli, or by collection of circular muscle fibers 1 or 2 cm apart; the haustra are responsible for the sacculated appearance of the colon. (haw'strŭm, haw'stră), [TA] The correct plural of this word is haustra, not haustrae. One of a series of saccules or pouches, so called because of a fancied resemblance to the buckets on a water wheel. haus´tra co´li sacculations in the wall of the colon produced by adaptation of its length to the tenia coli, or by the arrangement of the circular muscle fibers. a general term denoting a recess or sacculation, as of the colon. One of a series of saccules or pouches, so called because of a supposed resemblance to the buckets on a water wheel. pl. 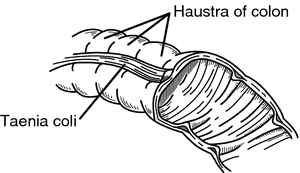 haustra [L.] one of the pouches of the large intestine, produced by the puckering action of the tenia coli and responsible for circular muscle fibers at 0.5 to 1 inch distances, and responsible for the sacculated appearance of the large intestines of horses and pigs. To investigate differences in lipid class composition among hatchlings of Cominella virgata, Cominella maculosa, and Haustrum scobina, permutational analyses of variance (PERMANOVA; Anderson, 2001; Anderson et al. A maximum of eight lipid classes were identified in hatchlings: six in Cominella virgata, seven in Haustrum scobina, and eight in Cominella maculosa. Differences between the Cominella species and Haustrum were also similarly explained, with 90% of the differences due to quantities of PL, which were greater than both TAG and ST (Table 1). differences were detected among the study species, including the absence of WE and ME in Cominella virgata and the absence of FFA in Haustrum scobina. This finding suggests an important trade-off between hatching size and energy content and a possible key role of nurse-embryo-feeding in Haustrum scobina. Our observations suggest that female Cominella maculosa controls allocation of resources among embryos within a capsule more effectively (via non-adelphophagic, intracapsular feeding) than does female Haustrum scobina, with its nurse-embryo-based strategy.